Purchased from Geelong City Toyota with 112,000Kms on clock. Standard boost pressure 50Kpa, fitted a manual boost adjuster and now running around 70Kpa. I would estimate power to now be around 180Kw on a cold day. Replaced battery. Car was still under its 3 month warranty, but batteries not covered. All 4 shockers had to be replaced. Rear shockers expired and fronts were leaking fluid - so had them all replaced. Car handled much better after that. Diff rebuild. Diff had developed a knocking noise on overrun that was getting progressively worse. I had heard the knock very faintly on occasions since purchasing the car but had not been able to pinpoint its source. A pin had broken in the diff (mechanic said it was caused by someone doing too many burnouts!) and left the diff mechanism loose - making a knocking sound. Ignition lock failed. Apparently a dag of metal came loose from the barrel of the lock and prevented the lock from being able to turn to the "start" position. Had to get a locksmith to dismantle it and fix the problem. Blown the interior light several times, and the light wont work when the back doors are opened, only the front. Took a rock through the headlight which left a nice hole. Headlight still works, but I am not looking at replacing it when I sell the car. I expect it to be worth a bit. Horn died, so I replaced it with a nice loud airhorn. Electric boot popper died. But happily I found it was only loose wire. Nearly got hit by lightning in Jan 97. Missed by only about 20m when I was driving back to Geelong from Camperdown. Big thunderstorm had rolled in after a hot day, and a bolt hit in the grass just on the other side of the road, with big clouds of black smoke shooting up from the grass. When we got back to Geelong we heard that 2 people had been killed in the Eastern Gardens after they were hit by lightning bolt. After we left Camperdown, the boat we had been water-skiing on that day sunk on the lake after big 1m waves started rolling in during the sudden storm. They had left one side of the lake and it was still sunny, and within about 5 minutes, the storm hit and turned the lake into a surfbeach. Unbelievable. Rear springs got the sags after I had the car for a couple of years and had to be replaced. Both low-beam headlight bulbs blew within days of each other. Were easily replaced though. Chewed a universal joint where the driveshaft connects to the output from the gearbox. This was causing nasty vibration under power. Melted part of the fusebox. This is located in the engine bay pretty close to the turbo/exhaust outlets. This heat in conjunction with me wiring up high wattage (and therefor high current) headlamp bulbs resulted in the plastic of the fuse holders melting. Was driving at night on twisty a country road in the rain, and nearly had a heart attack when all the interior and exterior lights went out. Had to do some quick fuse-bypass wiring to get things going again. Fuel consumption is very poor. I sold my 5 Litre V8 and thought that the 3 Litre six would give better fuel economy. Forget that, its probably my driving style but I am lucky to get much over 300Km from the 60L tank. Can get around 10L/100Km if doing purely highway driving though. Easy to drive, bags of power once the turbo kicks in from 2500rpm onwards. Can break traction half way through 2nd gear in the dry! Chewed rear tyres. Not the cars fault though... More my lead foot. No LSD which makes the car a lot easier to drive in the wet. When one wheel starts to spin the car still points straight ahead, unlike my VR V8 which would try to spin 180 degrees under full power in the wet. Have surprised many other cars in the traffic light grand-prix. My car looks very plain from the outside as it doesn't even have mag wheels. Can smoke most other cars fairly easily as long as you don't break traction and light up the rear tyres. Car has got a cruise control installed which has saved me from getting too many speeding fines. Fitted a boost gauge so I could see exactly how much boost the motor is running at any stage. Used some wire to clamp the plenum chamber over-boost valve shut. 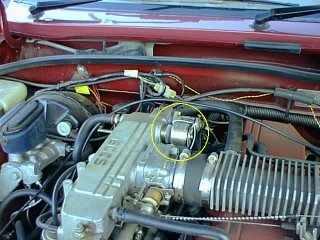 Once the boost had been wound up past the standard factory settings, this backup valve would open to limit the boost run by the motor. By clamping this shut there is effectively no max limit to boost allowable. Fitted an electronic meter to show the exhaust gas fuel/air mixture. This is important as if you have too much boost wound on and the fuel injectors cant deliver enough fuel, the mixture will go lean. Under full throttle, lean mixture means the motor will go boom. Fitted a cold air intake. Turbos like cold air. So I covered up the standard air intake which is behind the passenger side headlight. Then used a hole saw to drill hole through the bottom of the air cleaner box, through the metal work and then plumbed 80mm stormwater piping down and out to under the front spoiler. Air is now collected via this pipe and hopefully gets some "ram" charging as the car is driving along. Soon to be installed is a blow-off valve to allow the turbo to remain spinning fast during gear changes. Currently the turbo slows to a stop when you take your foot off the accelerator to put the clutch in. 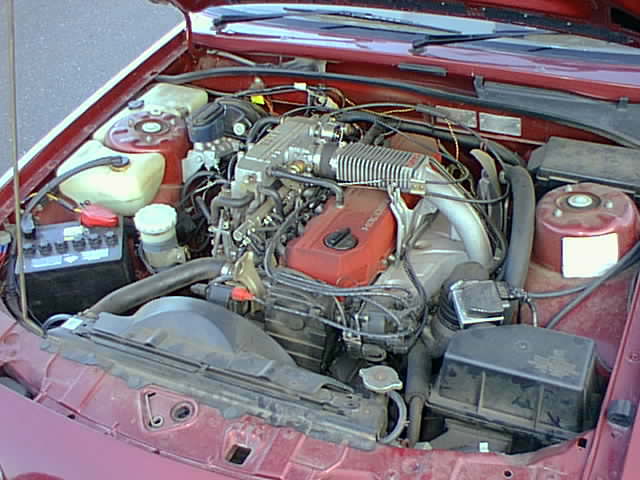 This causes big back-pressure in the intake system which slows the turbo. 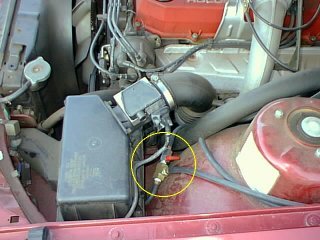 A blow-off valve opens when this is back-pressure to allow the gas to vent and thus the turbo keeps spinning under its own momentum.